Performing Spaces activates architecture with site-specific sound and light performances. For the spring/summer 2016, Moving Pictures Gallery and Amplifier are touring to arts and music festivals with site-specific audiovisual stages to augment and enhance the night. Performing Spaces is about how these technologies can be extended into the built environment using immersive media to transform our relationships to spaces, tell stories, and envision the future of our communities. Through site-specific light and sound installations, artists using custom audiovisual technologies will transform architecture into immersive experiences with stunning experimental animations and sounds. 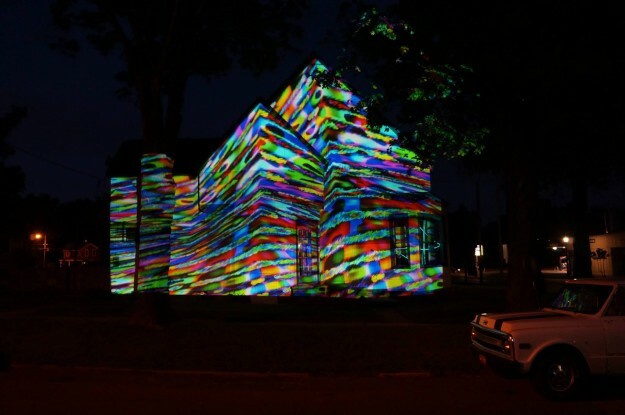 Moving Pictures Gallery artists are among the most innovative audiovisual performers in the field. Using cutting edge tools, techniques and virtuosic performance, our roster of artists captivates audiences all over the world. Eric Barry Drasin – co-founder of Moving Pictures Gallery is an artist and curator working at the intersection of digital media, performance and installation. Over the last few years he has produced some of the most compelling Realtime Media Exhibitions in NYC, working with the most exciting artists to emerge in the medium. He is the founder of the Fast Food video art collective and has exhibited and performed at galleries, theaters and museums throughout NYC. Benton C Bainbridge – co-founder of Moving Pictures Gallery is a media artist based in the Bronx. Working with custom systems of his own design, Bainbridge creates immersive environments, interactive installations and time-based artworks. He has shown across 5 continents, collaborating with artists including Beastie Boys, Kaki King, Pauline Oliveros. Benton has been the resident media artist at American Museum of Natural History’s monthly event “One Step Beyond” since its inception. 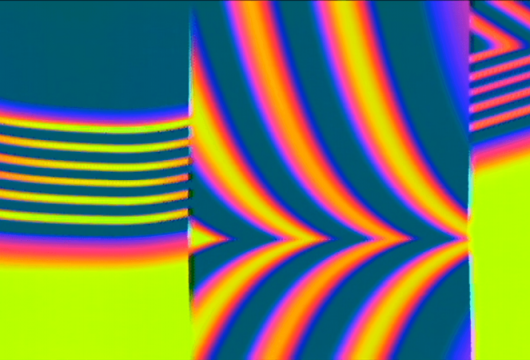 Jonas Bers is an audiovisual noise artist and performer based in the Hudson Valley New York. In his recent process, obsolete video equipment is modified for use as performance instrumentation to create an audio-visual synaesthetic score. Moving Pictures Gallery produces exhibitions investigating the way real-time media technologies can be extended through performance to transform relationships and connections. Amplifier uses art and design as a tool of urban transformation and city-making. Amplifier creates programs that connect public and private groups with the global art and design field to bring the most innovative work–often highly concentrated in large cosmopolitan centers–to under-served groups and smaller cities around the country, where it can have the greatest possible resonance. DOCK STREET DIG: An Archaeological Survey. 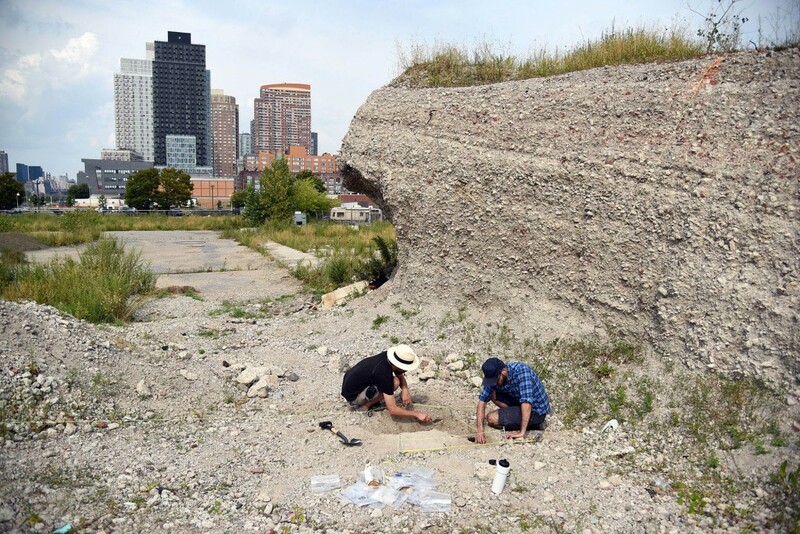 On view at Radiator Arts Dec. 17th through Jan. 22nd, Chance Ecologies: The Wild Landscape of Hunter’s Point South, displays the results of a daring summer-long experimental art project on a large plot of publicly owned land in Hunter’s Point, Long Island City, Queens. The accidental post-industrial landscape, predominantly disused for the last 35 years, harbored a rich unplanned ecology that participating artists explored through a series of secret temporary installations, performances, and research interventions. Located in the mouth of Newtown Creek, a federal Superfund site, and facing magnificent views of Midtown Manhattan across the East River, the site embodies the paradoxes of man-made ecological crisis and the continued drive towards the production of human habitats. RadiatorArts (Radical Mediator for the Arts) provides local and international emerging and mid-career curators and artist-curators an excellent opportunity to work with and learn about the operations of a multi-disciplinary organization. Radiator will regularly present contemporary art exhibitions, performances and video programs. Each curator is expected to work cooperatively, be flexible, self-motivated, and interested in contributing to the ongoing needs of this active multi-arts center.